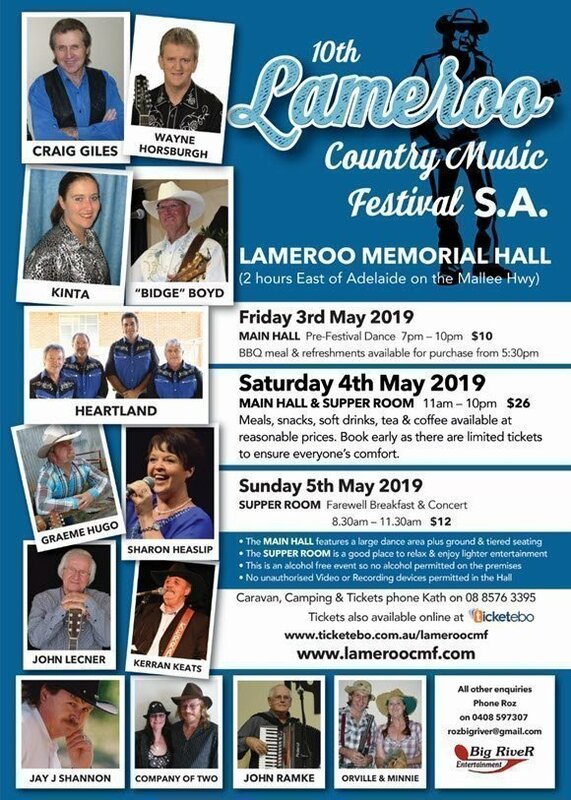 The Lameroo Country Music Festival was launched in 2010 and is known as one of the most popular annual events in SA. There is no problem about inclement weather as the festival is held indoors at the impressive Lameroo Memorial Hall. The Hall features two great venues all under the one big roof. Firstly the huge Main Hall which features a large dance area, plus both ground-level and tiered seating. Secondly, the Supper Room is a good place to relax and enjoy lighter entertainment. - This is an alcohol free event. No alcohol permitted or sold on the premises. - No unauthorised video or recording devices permitted due to copyright laws. - All artists will have their merchandise for sale at the event and also will be available for autographs and interviews. Friday night kicks off with the popular "Dance Party" in the Main Hall with a variety of artists. Friday: Barbeque available from 5:30pm. for an additional cost. Tea, Coffee & Soft Drinks also available. Saturday has a first class line-up of local and interstate entertainers in both the Main Hall & The Supper Room. Saturday artists: GRAIG GILES, WAYNE HORSBURGH, KINTA, “BIDGE” BOYD, HEARTLAND, GRAEME HUGO, SHARON HEASLIP, JOHN LECNER, KERRAN KEATS, JAY J SHANNON, COMPANY OF TWO, JOHN RAMKE, ORVILLE & MINNIE and more. Sunday is the Farewell Breakfast in the Supper Room (and is only available to patrons who have also attended the Saturday events). Includes breakfast & light entertainment. *Tickets will be exchanged for wristbands on the day. Please present your printed ticket at entry. Event Notes:For Accommodation enquiries please phone Kath on 08 8576 3395. For all other enquiries please call Roz on 0408 597307 or email us using the Contact Organiser form above.